Amnesty International has urged the Indonesian government to investigate the killings of three members of a religious minority group by a mob on the island of Java this weekend. The killings occurred when reportedly over 1,000 people wielding rocks, machetes, swords and spears stormed the house of a leader from the Ahmadiyya minority faith in the sub-district of Cikeusik, Banten province on Sunday. Several more Ahmadis were wounded in the attack and two are said to be missing. 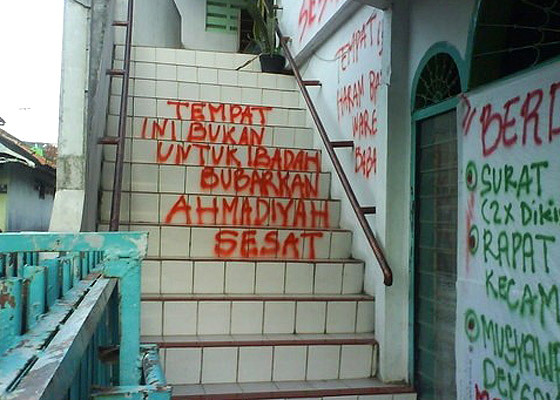 “This brutal attack on Ahmadiyya followers reflects the continued failure of the Indonesian government to protect religious minorities from harassment and attacks and to hold the perpetrators accountable,” said Donna Guest, Asia-Pacific Deputy Director at Amnesty International. The Ahmadiyya are a religious group who consider themselves a part of Islam, although many mainstream Muslim groups say they do not adhere to the accepted belief system. The mob surrounded a house where at least 18 Ahmadis were gathered, demanding that they disperse. They then charged inside the home, attacking and killing three Ahmadis identified as Roni, Tarno and Mulyadi. The victims were found with multiple injuries including stab wounds and lacerations. At least five others were seriously injured and the whereabouts of two are said to be unknown. The mob also destroyed the house, as well as vehicles parked around it. 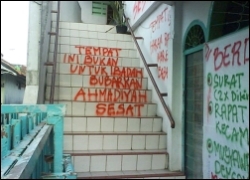 Amnesty International has documented numerous cases of intimidation and violence against the Ahmadiyya community by radical Islamist groups in various parts of Indonesia. These include attacks and burning of Ahmadiyya places of worship and homes, at times leading to their displacement. In most cases, those who commit acts of violence against the Ahmadiyya are not punished and there is a tendency by the authorities to blame the minority for “deviant views” when attacks occur. Harassment and attacks against the Ahmadiyya community are also fuelled by a 2008 joint ministerial decree forbidding the Ahmadiyya from promoting their activities. In September 2010, Indonesia’s Minister of Religion, Suryadharma Ali, called for the Ahmadiyya to be banned. The government must repeal all laws and regulations that restrict the right to freedom of religion as guaranteed in Article 18 of the International Covenant on Civil and Political Rights (ICCPR) and initiate an independent and impartial inquiry into all cases of intimidation and violence against religious minorities in Indonesia. Amnesty International has also called on the National Human Rights Commission (Komnas HAM) to investigate allegations that the police did not take adequate steps to protect the Ahmadiyya followers who were gathered, or to prevent Sunday’s attacks. “Indonesia must develop a concrete strategy to strengthen respect for freedom of religion and religious tolerance, which has clearly deteriorated in recent years,” said Donna Guest.